The Dodd-Frank Wall Street Reform and Consumer Protection Act of 2010 introduced the most far-reaching federal regulation the property/casualty insurance industry has ever seen. While the regulatory focus of Dodd-Frank has been on a relatively few insurers that either have subsidiary banks or are considered systemically important financial institutions (SIFIs), the act is poised to affect the entire property/casualty industry, according to my recently published Actuarial Review article, Demystifying the Regulatory Web: Dodd-Frank and Its Complex Impact. 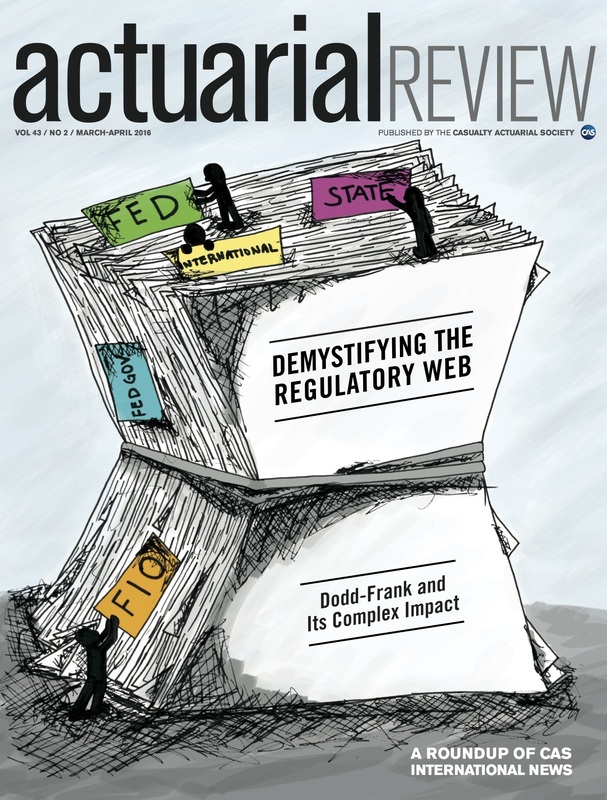 My article takes a rare, comprehensive and journalistic look into the ramifications of Dodd-Frank and the resulting regulatory web. During my research, I could not find one article that updates the multiplicity of Dodd-Frank’s impact on insurers. And after spending countless hours on the article, I could not put my finger on anything that substantially makes the insurance industry and its customers better off. If anything, federal regulation is onerous and hardly transparent. States, which have been regulating insurance for 150 years, have much more transparent processes as does the National Association of Insurance Commissioners (NAIC). Dodd-Frank requires its brainchild, the Federal Insurance Office (FIO) and the Federal Reserve System (Fed) to work with the NAIC at the International Association of Insurance Supervisors’ (IAIS). Since then, transparency has dimmed. Formerly open meetings have been closed. In one instance, a presidential appointee told a congressional subcommittee he was barred from attending an IAIS working group meeting. and its customers better off. To further complicate matters on the international stage, the Fed, FIO and the NAIC, known as “Team USA,” have different missions that sometimes conflict with one another. The federal rule making process also lacks the kind of transparency states offer. Information access to reporters is also very limited. Federal agencies provided me with plenty of documents to wade through, but subject matter experts were not available for questioning. This disturbs me greatly. I also wondered how the activity of one large U.S. insurer’s London-based banking subsidiary could justify Dodd-Frank’s introduction of federal insurance regulation and monitoring. Ironically, both federal agencies depend greatly on the NAIC even as their activities seem to overlap the organization’s historic role. In some cases, the Fed and the NAIC are on separate regulatory tracks to address the same concerns. Meanwhile, Dodd-Frank directs the FIO to look into coverage discrimination issues, which is old hat for state regulators. For example, the agency choose to evaluate auto insurance discrimination when state regulators and research organizations have been considering the claims of consumer groups for decades. All parties say they are committed to working together, but communication has been challenging. The FIO has the primary role of monitoring the industry and one direct regulatory role to develop international cover agreements. Through its monitoring efforts, the FIO identified new regulatory opportunities for insurers. Meanwhile, it’s been seven years since the enactment of Dodd-Frank and the Fed still has a lot of rule making to do. Besides going through that arduous process, the Fed is also working to appreciate the deep magic of insurance. This includes the role of actuarial opinion, which is part of the special sauce that makes individual companies competitive. Federal intervention has reintroduced the time-honored question of whether states or the federal government should regulate insurers. Labor groups have long advocated for federal regulation for workers’ compensation. There are pros and cons to both approaches. If the federal government regulates insurance, one benefit would be regulatory consistency across state lines. Certainly the international community, including Europe, prefers the approach of central governance for the United States. This difference in regulatory approach between central authority and state authority is not merely an academic discussion. The Jeffersonian notion of states rights to prevent the oppression of centralized authority was a direct reaction to the European central authority model that goes back to at least the Roman Empire. Based on other topics I have covered, the United States needs to be very careful with taking euro-style approaches when the downsides most likely outweigh the benefits. There are fewer insurance companies operating in Europe partly due to regulatory burden. It can be argued that state-based regulation is a key reason why the United States has the largest insurance industry in the world. While imperfect, the state regulatory model allows for greater innovation and flexibility. Under a truly federal regulatory model, for example, could Texas to continue to allow employers to opt out of workers’ compensation? By digging deeply into the details of Dodd-Frank’s implications for property/casualty insurers, my hope is the article will be informative and thought provoking. I am grateful to the Casualty Actuarial Society for giving me the opportunity to provide a comprehensive look at Dodd-Frank. The Fed’s media staff provided very useful congressional testimony and the NAIC, the Property Casualty Insurance Association of America and the American Academy of Actuaries all provided the necessary support to complete my article. How do you think Dodd-Frank is affecting insurers?